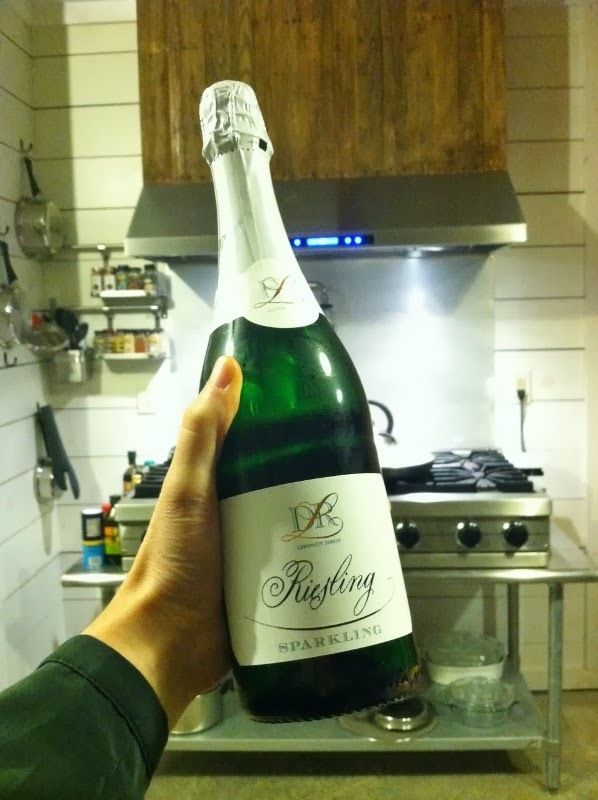 This bottle of bubbly was leftover from New Year's Eve, and last night was the perfect time to pop the cork. Yesterday, after two days of speculation and occasional twinges of anxiety, we heard from our loan officer. You guys, we met our target and then some. And then some more on top of that. We're so relieved! I had to fight back tears when I got the text from Ez, and since then I have felt so much lighter. Now we can refinance, which will allow us to pay off this house in half the time and barely increase our monthly payment. Craziness, right? We also feel validated -- I think that's the right word -- that the past five years, challenging though they were sometimes, were worthwhile. I want to thank all of you, especially those who have been reading since the beginning, for your kindness, support and encouragement. Though we're not finished by any means, this milestone is absolutely huge, and we wouldn't have gotten this far without the help of a lot of people. Congrats! I'm so thrilled for you! Are you going to take a week or so off, get some sleep and enjoy the new space(s)? Or are you at the "things are so close, might as well do X, Y, and Z and be done!" Thanks so much. To answer your question, a little bit of both, I guess! We definitely won't be going at the same pace as before so we can have some time to recover, but we'll be trying to keep moving forward too. We can't really use the new spaces until the floors are finished (why buy dining chairs, a new bed, etc. if you just have to move them out later to do the floors?) so we'll be focusing on the floors next. We rented a big sander, so tonight we'll be taking that for a test run! Congratulations! What a huge accomplishment. I haven't commented in awhile, but CONGRATS! Yall deserve it. Major Congratulations! You're over the hump and rolling down hill from here. and the freedom to enjoy the fruit of your labors. I legitimately got a little misty eyed reading this knowing how excited, relieved, and everything in between you guys must be! You have done an amazing job on everything; the place looks amazing!! It's been so much fun following along with you on this journey! I must admit I'm kind of a Cabin Fervor addict :) Thanks for giving all of us a sneak peek! Many prayers for you to enjoy this victory and strength for the tasks that still lie ahead! <3 Cheers! yahoo! i'm so glad it turned out well. and now you don't have that enormous task hanging over your head. curious...you mentioned a while back that you guys decided this wouldn't be a long term home and it helped you come to terms with the ongoing renovation. do you still feel that way now that the house is shaping up and getting closer to being done (and gorgeous)? wow......now it will seem like fun..........watching the house turn in to a wonderfully comfortable family home.........take your time and enjoy the process. Huzzah!! Congratulations. That's great news!